Climate change is slated to have some pretty nasty effects on the biodiversity of the planet; species are already disappearing at rates 100-1,000 times faster than normal, and scientists have warned that we’re heading towards a mass extinction event, the likes of which haven’t been seen for over 65 million years. Among the species that are feeling the burn are many of the plants that we rely on for food, including staples like corn, wheat and rice. While these crops aren’t projected to go extinct, the warming climate (and the pressure that comes with it) is anticipated to decrease global crop yields, which carries negative implications for anyone that wants to keep eating food. The macro view is pretty simple: higher temperatures are wreaking havoc with many plants (and animals); but what’s happening at the micro level? How are warming temperatures impacting the specific life functions of individual crops? And if we understand what’s occurring at the organismic level, can we help plants thrive in a warmer world? Scientists from Germany’s Martin Luther University Halle-Wittenberg (MLU) certainly seem to think so; in a paper published in Current Biology, a team of researchers there laid out an explanation for how temperature impacts plant growth at the molecular level. The researchers believe they’ve pinpointed the hormone that is responsible for controlling plant growth at hotter temperatures, which determines physical traits like how tall it grows and how quickly it goes to seed. If correct, this deeper understanding of the mechanics behind plant growth could help plant breeders produce strains of grains that have better yields in a climate-change filled future. Quint explained that plants respond to higher temperatures by growing taller and skinnier, and growing their leaves farther apart. This might not sound that bad, but these traits make plants more unstable, putting them at risk of bending or snapping under the pressure of things like rain or wind. Higher temperatures also decrease the time that plants have to build up their biomass before going to seed; this means less energy goes into the kernel, which is what we harvest and eat in most crops. “By simply affecting height and flowering time, temperature has a significant negative effect on crop yields,” said Quint. Earlier studies have pinpointed the protein PIF4 as one of the triggers in this heat-stress reaction: PIF4 is thought to be responsible for regulating plant growth under higher temperatures. But what activates this protein has been a bit a mystery, until now. The team from Halle believes they have found the hormone (called brassinosteroids) that when turned on, activates PIF4 and thereby makes the plants taller and go to seed prematurely. 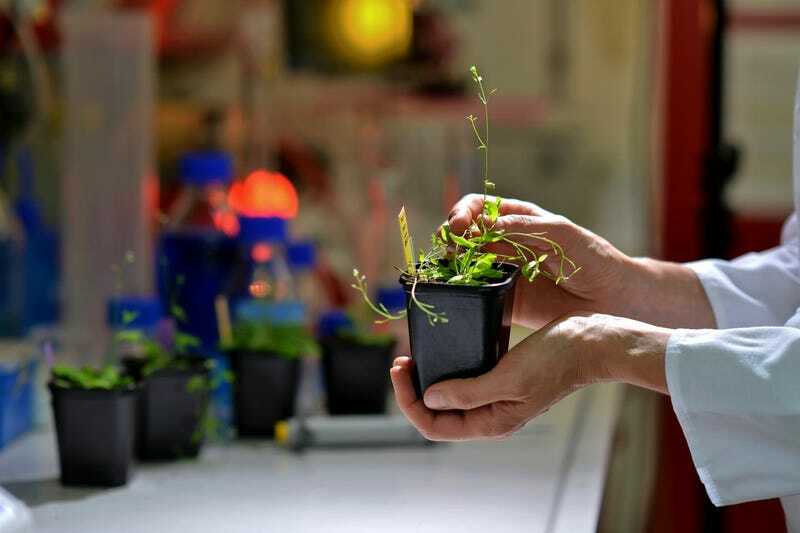 This new understanding of how PIF4 is turned on (or off), could prove a critical key for plant breeders who wish to produce crops that respond differently to higher temperatures. While Quint is excited about plant breeders making use of PIF4 and it’s associated hormone, he cautioned that there’s still much more research left to do in order to understand how to best prepare plants for warmer temperatures. “I would like the field move to understand the effect of temperature on the entire organismic level: so how does temperature effect plant growth in its entire vegetation time, how does it affect the different processes that are underlying growth? All of this needs to be better studied,” explained Quint. The research coming from MLU is just one of several new findings that givecrops thriving in the changing world. Another important breakthrough came last December in the form of increasing the rate at which plants can be bred. A new system called speed breeding, allows plant breeders to grow six generations of crops a year (as opposed to one a year under normal conditions). By using LED lighting that allows plants to grow for up to 22 hours a day, a team from the John Innes Centre, a British biotech, has been able to produce up to six generations per year of wheat, durum wheat, barley, pea, and chickpea. Each generation can be used to study the way plants deal with things like heat stress and diseases, and better understand their structure, flowering time, and growing cycle. Then, the best and most promising strains can be bred further, creating more resilient crops. The ultimate goal of the work coming from MLU, the John Innes Centre, and other institutions worldwide focused on agricultural processes, is the same: keep the world from starving as it faces the dual pressures of increased population and harsher temperatures. Let’s hope they get it right.